In the last two decades, service-oriented approaches have radically changed the way in which software and systems are conceived, designed, and implemented. Favoured by the increasing adoption of internet-based technologies, service orientation has answered to the related increasing demand for connectivity at different levels: from software components to information systems, up to entire organizations. Upon this basis, Service Oriented Architectures, inspired by a common reference model, define the ground for organizing and utilizing distributed capabilities that may be under the control of different ownership domains. Service Oriented Computing defines the basic constructs to support the rapid and easy development of distributed and heterogeneous applications. Finally, Service-Logic Dominance takes a more business-oriented perspective to improve way in which service users can be engaged and can properly consume the services. Although service-based systems are currently adopted in several domains (i.e., autonomic software, B2B integration, …), the new technological trends and the new business opportunities are posing and will pose significant challenges for both researchers and practitioners. 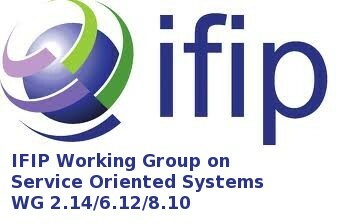 The IFIP-WG on Service Oriented Systems aims at organizing and promoting a fruitful exchange of information among academics and practitioners within the scope of improving the engineering, further research, and exploitation of service-based systems. In doing so, the working group considers service-oriented systems from a technological perspective, but also addresses their business aspects as well as their social and economic impact. The aim of the WG is also to structure a research community that comprises both academia and industry (e.g., through living labs) and also to support an active, permanent, and international forum on services-oriented systems. The underlying multi-disciplinary nature of this WG was originally recognised by its proposers and includes IFIP TC2 (Software: Theory and Practice), TC6 (Communication Systems), and TC8 (Information Systems) initiatives. At least one WG meeting is organized once a year in conjunction with the ESOCC conference, others may be organised as offered by WG members. During these meetings, WG members and WG “friends” are invited to participate and to contribute to specific themes that are decided in advance. Meetings are an opportunity for the participants to share their work, thoughts, and ideas with other members in a situation which is more informal and more open to the discussion than usual conferences and symposiums. A positive side-effect of these meetings is to open new collaborations that, based on the previous experience, could result in new projects or research activities. Moreover, the presence of industrial players could open the possibility to make easier the technological transfer. A particular emphasis is given to Ph.D. students which research themes related to service oriented systems. Their presence at WG meetings is encouraged in order to give them the possibility to present their work to a qualified audience which could give them important feedback. Also, the presence of Ph.D. students may help the WG community to identify and study new challenges.